A rare Ming dynasty terracotta funerary table from 15th-16th century China. This table was made with terracotta during the Ming Dynasty and displays a variety of elements of food and drink. This small item is a typical Chinese altar, painted in green with tempera. Modelled and painted miniature food and drinks are arranged on it. 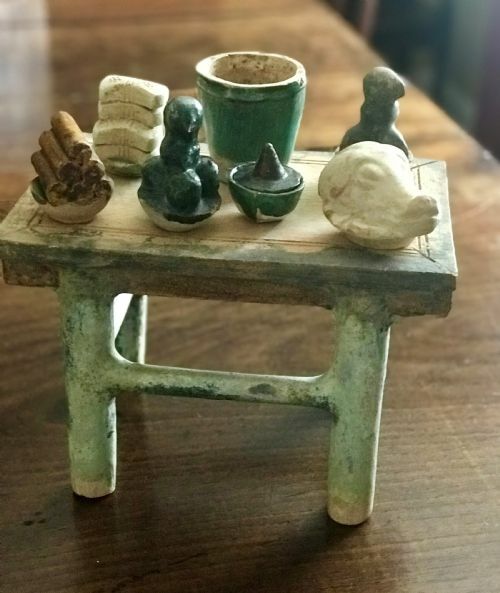 Called Mingqi, these kinds of terracotta models were traditionally placed in the Chinese burials for the wealthy deceased, in order to assist the them in the afterlife, a practice that dates back to the Neolithic Period. Mingqi: sometimes referred to as "spirit objects" are Chinese burial goods. They included daily utensils, musical instruments, weapons, armour, and intimate objects such as the deceased's cap and bamboo mat. Mingqi also could include figurines of soldiers, servants, musicians, polo riders, houses, and horses. Mingqi served to provide the deceased with necessities and comforts in the afterlife. The deceased person's corporeal spirit was said to remain in the realm of the tomb while the ethereal spirit ascended to heaven. To appease the deceased's corporeal spirit mingqi that were relevant and liked by the deceased were placed in his tomb. Upon placing mingqi in the tomb, humans, according to the Confucian ideal, were harmonizing the cosmos by striking a balance for the comfort of the deceased who is also comforted in heaven. 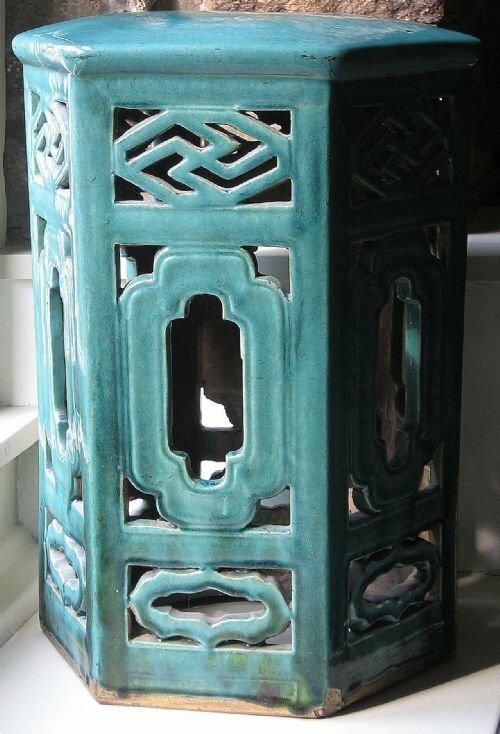 Although this item is in the earlier Han Dynasty style (206 BC–220 AD), it is probably Ming Dynasty (1368–1644) . Chinese potters often used an earlier style as a mark of respect to their ancestors. SIZE: height 7 inches. width 10 inches. depth 6.5 inches. PROVENANCE: With certificate of authenticity from antiquities specialist Vanessa Purcell & Co. 28th April 1995. This is an absolutely spectacular ceramic; the skill needed to pot such a large bowl is great. Over 2 foot in diameter, 9.5 inches deep and of considerable weight this is a commanding piece. Beautifully hand painted with lotus and chrysanthemum scrolls; lotus conveys the notion of happiness in maturity, creative power, genius and marital happiness; the chrysanthemum represents autumn, joviality and a life of ease. The bold decoration, with cresting waves and the lotus and chrysanthemum are in the 15th century style of the Ming Dynasty, although they were revived in the 18th century under the Emperor Qianlong of the Qing Dynasty. This bowl, superb as it is, is neither of those. Dating only from the late 20th century it is a homage by a modern potter to the masters of the past. 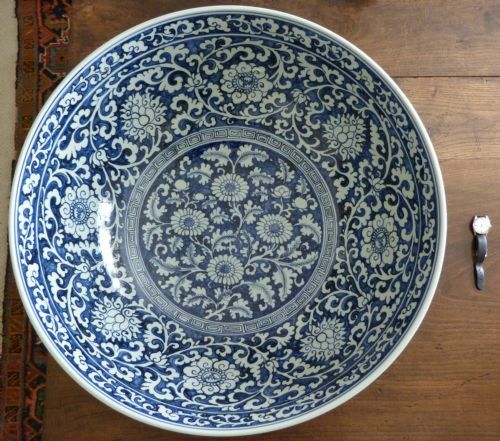 As can easily be seen on this website we deal in fine antique items, not reproduction items....however, this bowl is so magnificent that an exception was made; although not old it is a fine art object. If it were what it appears to be it would be of immense value. We make no apology for its inclusion...it would enhance any room. DIMENSIONS: 25 inches in diameter. 9.5 inches tall. The dragon in Chinese mythology is lord of the skies and benevolent bringer of rain. In addition, therefore, to symbolising authority, strength and goodness, as of the emperor, it is also symbolic of fecundity and fertilty. The lotus conveys the notion of happiness in maturity, creative power and genius. In nature the lotus grows in muddy water but emerges clean from it, thus symbolising purity in adversity. SIZE: 61 cm tall (25 inches). 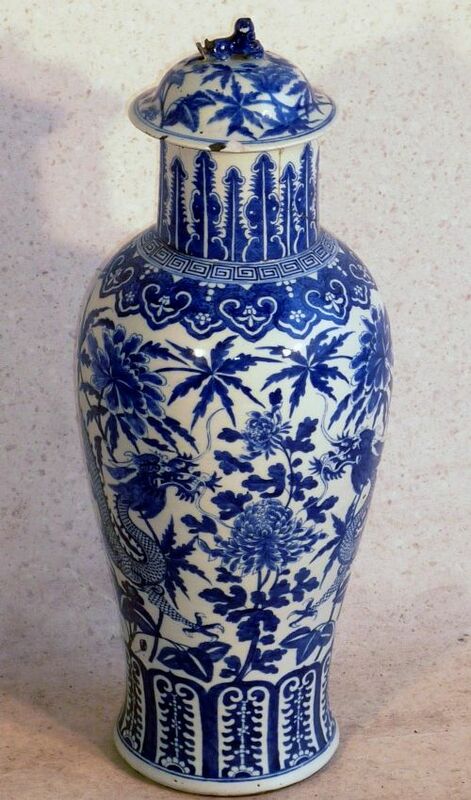 CONDITION: Although suffering from some chips and old poor quality repairs, this vase is of an impressive size and has considerable beauty and presence, the damages not being obtrusive. An ancient Chinese attendant figure from a Tang Dynasty tomb, 1300 to 1000 years old. Originally the figure, still bearing some of its original paint, would have held a wooden stick to symbolise the light that would be used to guide the deceased through the Afterlife. The Tang Dynasty was an Imperial dynasty of China, with its capital at Chang'an (present-day Xi'an), the most populous city at the time in the world, it is generally regarded as a high point in Chinese civilization—equal to, or surpassing that of, the earlier Han Dynasty—a golden age of cosmopolitan culture. Its territory, acquired through the military campaigns of its early rulers, was greater than that of the Han period. PROVENANCE: English private collection for the last 16 years.